Over the holiday period we’ve been working on the latest podcast in our One Minute Languages series. 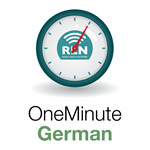 One Minute German launches on 10 January and in weekly episodes you’ll be able to pick up the basics of German. More languages coming soon. One Minute German website.